Located on the Oklahoma Health Center Campus the Embassy Suites Oklahoma City Downtown/Medical Center hotel is within walking distance of the University of Oklahoma Research Park the Stephenson Cancer Center and Toby Keith*s OK Kids Corral. We are the closest hotel to the Oklahoma State Capitol and government agencies and the only hotel with quick access to Bricktown located just of Lincoln Boulevard. We provide a complimentary shuttle within a three-mile with convenient pick up and drop off for guests and patients of the Oklahoma Health Center Campus. Catch a sports game at Chesapeake Energy Arena explore the lively entertainment district of Bricktown and attend an event at the Cox Convention Center less than two miles away. Take advantage of our complimentary shuttle service to many nearby businesses and attractions. Our spacious open-plan suites offer a separate bedroom and sitting area. Cool drinks in your mini-refrigerator and stay connected with WiFi. Start each morning of your stay with a complimentary full hot breakfast buffet and return to the hotel after a busy day to unwind over drinks and snacks at our complimentary Evening Reception*. Enjoy dinner in the Embassy Suites Grill or order a snack from our evening room service menu. We offer an indoor pool and the latest cardio and weights equipment in the complimentary fitness center. With 10 482 sq. ft. event space including a divisible ballroom and three custom outdoor patio spaces this modern hotel in Oklahoma City is ideal for a variety of conferences training events and weddings. Complimentary WiFi and useful services including printing are available in the BusinessLink Business Center. *Service of alcohol subject to state and local laws. Must be of legal drinking age. E.S. 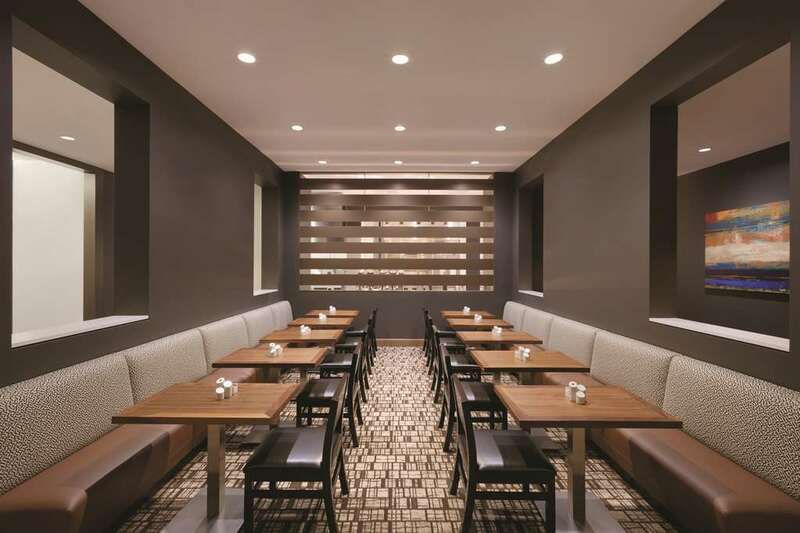 Founders: Hotel Restaurant offers a selection of American Cuisine and Local Favorites. We have hot and cold options Vegetarian choices and a kids menu. Truly a restaurant with something for everyone. In-room dining is also available for guests between 1100am and 1100pm.